Gabriel's Journey is the third book in the Racing to Freedom Trilogy by Alison Hart. Also included in the trilogy is Gabriel's Horses (book one) and Gabriel's Triumph (book two). Together, the trilogy explores the complexity of African American History and the Civil War with a stirring character and his love of horses. When thirteen-year-old Garbriel leaves the home of his former master to join his father in the Union Army, he finds he is too young to be a soldier. His experience caring for horses and as a jockey lands him the job of mucking stables and taking care of the Fifth U.S. Colored Calvary’s horses instead. When he tames the spirited horse, Champion, he gains the respect of it's owner, the white commander, Captain Waite. Gabriel's success taming Champion, earns him a uniform, his own horse and a chance to join the ranks of soldiers on their way to battle. He leaves with hope and desires freedom, but learns those words come with a price. Being a soldier is harder than Gabriel expected and his hope turns to discouragement when he encounters bad weather, low supplies and racism from both the Union and Confederate soldiers. When Gabriel's father and Captain Waite do not return from the battle of Saltville, Gabriel rides into the battlefield in search of them, putting aside his own fears and gaining courage along the way. Alison Hart's poignant end to the Racing to Freedom Trilogy provides a raw look into the African American contributions to the Civil War and the racism they encountered. The first person narrative through the eyes of a thirteen year old soldier, Gabriel, really drives the message of the atrocities of war and the love of family freedom and horses. For those looking for a great piece of historical fiction, I recommend the Racing to Freedom Trilogy. It is well researched and well written. 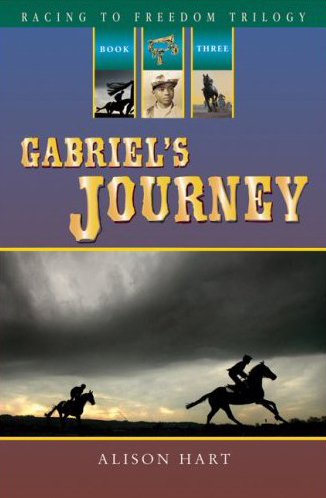 Check back for your chance to win a hardback signed copy of Gabriel's Journey.